Adapted from June 2011 Cooking Light magazine. Sort and wash beans; place in a bowl. Cover with water to 2 inches above the beans; let stand 8 hours. Drain. Heat a large saucepan over medium-high heat. Add 3 Tbsp. vegetable broth and sausage for 3 minutes. Add beans and 4 cups water; bring to a boil. Reduce heat, and simmer 2 1/2 hours or until beans are tender. Stir in 1/4 tsp. salt, 1/4 tsp. black pepper, and cumin. Heat a medium skillet over medium heat. Add 3 Tbsp. vegetable broth and 1 1/2 cups onion, bell pepper, jalepeno, and garlic; cook 8 minutes, stirring occasionally. Stir 1/4 tsp. black pepper and onion mixture into bean mixture. Bring 2 cups of water to a boil in a small saucepan over medim-high heat. Stir in 1/4 tsp. salt, rice, and turmeric. Cover, reduce heat and simmer 20 minutes or hntil liquid evaporates and rice is tender. 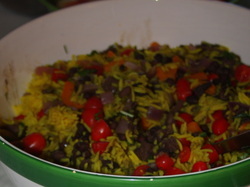 Spoon 3/4 cup rice into each of 4 bowls, and top each serving with about 2/3 cup bean mixture, 3/4 cup tomato, and 1 1/2 tsp. cilantro. Beans could probably be canned beans rinsed. Rice could probably be steamed rice done ahead of time.